The 4th - started and crossed Tuck-a-segee ford on the Catawba River 10 miles from Bennet Smith's. Took the road to the left instead of passing by Charlotte and slept 11 miles from Catawba River. Other entries in the journal of André Michaux mention staying in the home of the well known Peter Smith. A drawing of Jack C. Moore standing beneath the large leafed Magnolia trees on his property on Hoyle's Creek. 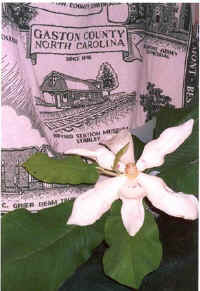 Jack owns the lands today on which André Michaux discovered the Magnolia macrophylla. Family tradition with the descendents of David Smith, the son of Peter Smith, says that in 1824, when David built his beautiful home in Lincoln County, he came back down to his father's home on Hoyle's Creek and retrieved seedlings of the Magnolia macrophylla and transplanted them on the grounds of his new home, which was thereby named Magnolia Grove. Though André Michaux was in the service of the French Government during his eleven years of exploration in North America, he also became well acquainted with the politically elite of this country such as George Washington, Thomas Jefferson, John Adams and Alexander Hamilton.